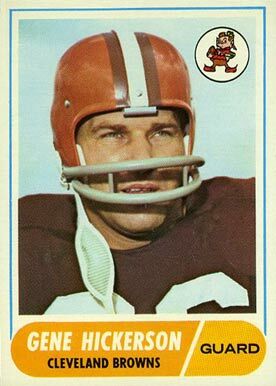 1968 Topps football card of former Cleveland Browns’ guard Gene Hickerson, who enjoyed a solid 15 year career in the NFL, all with the Browns. He was a six-time Pro Bowler and lead blocker on the Browns’ line for 3 different 1,000 yard rushers, all of whom are Hall of Famers – Bobby Mitchell, Jim Brown and LeRoy Kelly. Hickerson was voted to the NFL’s All Decade team for the 1960s, played on the Browns’ 1964 championship team and was inducted into the Pro Football Hall of Fame in 2007. He passed away in 2008.